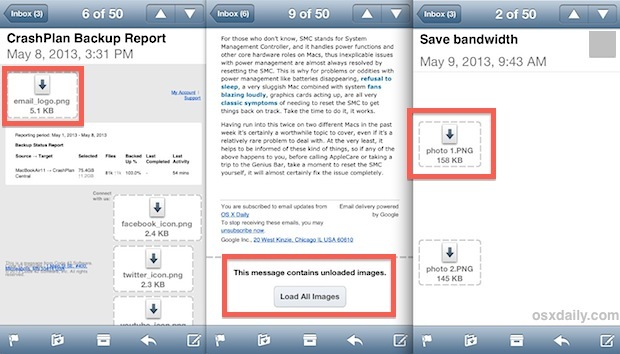 Emails opened in Mail app for iOS default to loading all images attached to that message. This makes emails format and arrange themselves as the sender intended, often with nice little header graphics and signature files, but it has a potentially serious downside: increased bandwidth usage. On a wi-fi connection that bandwidth usage hardly matters, but on many of the smaller and more limited cellular data plans, each KB and MB of data transfer is precious, and the little cutesy images and styling that comes over with many emails does nothing but eat up a data plan. There’s a simple solution to that problem though, and that means disabling remote images from being loaded into Mail app on the iPhone and iPad. 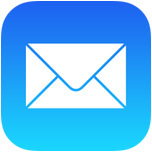 If you’re a heavy Mail user, this adjustment can greatly reduce your data consumption, and there’s a wonderful side benefit for older iPhone, iPad, and iPod touch models as well; a potentially substantial speed boost for using Mail app on older iOS devices. This applies to all modern iOS versions on iPhone and iPad. Either way the setting is immediate and will impact all emails that have not yet been opened, or where images contained within the message are not yet cached locally. The end result isn’t necessarily pretty, but we’re not saving bandwidth for it’s good looks. As mentioned above, you can still download the remote images from the mail server and load them into the mail message, all you need to do is tap on the image thumbnails with the giant arrow icons on them, or use that bottom “Load All Images” button. If you’re looking to save the images locally, you will need to download them first that way before the tap-and-save trick works. You’ll find an additional bonus here too, where you’ll now being able to see the file size of each image, letting you decide if that email attachment is worth downloading now over cellular, or if it’d be better to wait until you get on a wireless connection later. In an ideal world, this setting would be adjustable per connection, meaning for Wi-Fi connections the entire images would load, and for cellular data connections the images would not load. Though all iOS devices can reduce bandwidth usage with this trick, but it may be the most beneficial for 3G and LTE equipped models that are on tight data plans. This is an excellent trick for many reasons, and if you are on a smaller data plan, you should strongly consider using it. Through testing this trick we discovered a wonderful side benefit: a speed boost to Mail performance. If you are using an older iOS device you will find that disabling images can actually speed up Mail app quite a bit, at least when it comes to opening any emails that contain attached images. The effect is basically negligible on the iPhone 5, but on an iPhone 4 running iOS 6 it’s certainly noticeable, and it was reported to us that it makes a giant difference in performance on the iPhone 3GS and older iPad models, so give it a try and see what you think. There is a similar trick for Mail app on the Mac which also offers this speed boost, whereby turning off image attachment previews offers a world of improvement for older hardware simply because less system resources are used to load the pictures. Thus, it’s not surprising that the same tip applies to iOS. Obviously, this whole thing can be reversed back to default settings at any point by going back to Settings > Mail > and toggling Load Remote Images back to ON.